Gray and red foxes may only be trapped where provided by state or local law. For more information about fox trapping seasons, visit ncwildlife.org/FoxSeasons. Coyotes may be trapped during the regular trapping season and during any fox-trapping season, established by statute or by local law, using methods described in statute, even when those seasons open prior to and extend after the regular trapping seasons. Sell or otherwise transfer ownership of the carcass or pelt of a fox*, bobcat or otter without first tagging it with the appropriate tag available from the Wildlife Resources Commission. The fee is $2.20 for each bobcat or otter tag and $2.25 for fox*. You may purchase these tags by tele­phone, 888-248-6834, using a Visa or MasterCard credit card, or you can mail your request along with the fee to: NCWRC, Bobcat/Otter/Fox Tags, 1707 Mail Service Center, Raleigh, N.C. 27699-1700. Include your name, address, date of birth and WRC number. NOTE: All fox*, bobcat and otter fur must be tagged within 30 days of the close of the applicable season. *except where local laws do not require fox tagging. Open or damage a beaver lodge without a permit from the Wildlife Resources Commission. Sell, keep or transfer ownership of any live animals, except foxes or coyotes. Foxes and coyotes may be sold live only to licensed fox preserves and only up to 10 days after the trapping season. Take red and gray fox except where provided by state or local law. For more information on fox trapping seasons, visit ncwildlife.org/FoxSeasons. Take wild animals by trapping upon the land of another without having in possession written permission issued and dated within the previous year by the landowner or his agent. This restriction does not apply to public lands on which trapping is not specifically prohibited including tidelands, marshlands, and any other untitled land. Remove or disturb any lawfully set trap or remove any fur­bear­ing animal from a trap without permission of the trap owner. All traps must have a weather-resistant permanent tag attached with the trapper’s name and address legible. Unlawful to set or use a trap so that animals or birds will be suspended when caught. Unlawful to set or use a hook of any sort or type to take wild animals or wild birds. Must be smooth-edged and without teeth or spikes. To measure the width and height of a Conibear™-type trap, measure from inside jaw to inside jaw (Figure 1). On dry land, cannot have a jaw spread greater than 7 ½ inches. If totally covered by water, it can have an inside jaw spread (width or height) greater than 7 ½ inches and no larger than 26 inches in width and 12 inches in height. In areas of tidal waters, the mean high water is considered covering water. In reservoir areas, covering water is the low water level prevailing during the preceding 24 hours. Trap can be checked every 72 hours if completely submerged. In addition, if trapping for beaver, Conibear™-type traps can be set one-half covered by water, but must be checked daily. Must be smooth edged and without teeth or spikes. 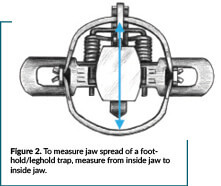 To measure jaw spread of a foot-hold trap, measure from inside jaw to inside jaw (Figure 2). Cannot have a jaw spread greater than 7 ½ inches. If the jaw spread is between 5 ½ and 7 ½ inches, the jaws must be offset by 3/16th of an inch. The jaws do not have to be offset if the trap is set in water with a quick-drown type set. Trap chain cannot be longer than 8 inches from anchor point to the base of the trap unless fitted with a shock-absorbing device with at least 40 lbs. and not more than 75 lbs. of pull. Trap chain can be measured from anchor point (solid ground) to the base of the trap. Can be used to trap only beaver, except where allowed by local law. Cannot be used to trap wildlife, except where allowed by local law. You should also read the “Game Lands” and “Local Laws” sections for trapping restrictions on certain game lands and in certain counties. Every trap must be visited daily and any animal caught therein removed, except for completely submerged Conibear™-type traps, which must be visited at least once every 72 hours and any animal caught therein removed. In North Carolina, it is unlawful for a person to interfere intention­ally with the lawful taking of wildlife resources or to drive, harass, or intentionally disturb any wildlife resources for the purpose of dis­rupting the lawful taking of wildlife resources on public or private property. NOTE: This law does not apply to activity by a person on land he or she owns or leases or to a person who incidentally interferes with the taking of wildlife resources while using the land for other lawful activity such as agriculture, mining or recreation. Violation of this subsection is a misdemeanor punishable for a first conviction by a fine not to exceed $1,000, by imprison­ment not to exceed 30 days, or by both and punishable for a second or subsequent conviction by a fine left to the discretion of the court (NCGS §113-295). If you experience unlawful harassment, immediately notify your nearest wildlife enforcement officer, county sheriff’s office or local police department. Advise the authorities of this law and that you wish to hunt peacefully. Do not provoke a fight, threaten reprisals or use profanity. Remember that some anti-hunting activists seek confrontation and may be accompanied by the news media. Dec. 1 – Feb. 28 In and east of Hertford, Bertie, Martin, Pitt, Greene, Lenoir, Duplin, Pender and New Hanover counties. Nov. 1 – Feb. 28 In all other counties. NOTE: In addition to the regular trapping seasons listed above, coyotes may be taken in counties, areas and times where fox-trapping is allowed by statute. Nov. 1 – Mar. 31 Statewide for beaver only. NOTE: Landowners whose property is or has been damaged or destroyed by beaver may take beaver on their property anytime by any lawful method without obtaining a permit from the Wildlife Resources Commission. The landowner may obtain assistance from other persons in taking the depredating beaver by giving those persons permission to take beaver on the landowner’s property. Jan. 6 – Jan.27 Fox trapping is allowed in Clay, Graham, Henderson, Macon and Tyrrell counties with a daily bag limit of two and a season bag limit of 10. Trappers must have fox tags prior to taking foxes, and the sale of live foxes under this season is prohibited. Visit ncwildlife.org/FoxSeasons to see if there is a local fox trapping season in your county. There is no closed season and no bag limit for trapping nutria east of I-77. There is no closed season and no bag limits for trapping feral swine. A hunting or trapping license is required, except for those persons who are license-exempt (see Wildlife Resources Commission). A feral swine trapping permit is also required, even for those persons who are license-exempt. This free permit is available at ncwildlife.org/FeralSwine. Only box and corral traps are legal for trapping feral swine and the permit number must be displayed on all traps. Traps must be constructed in a manner such that a non-target animal (such as a bear) can easily be released or can escape without harm. All feral swine must be euthanized while in the trap and may not be removed alive from any trap. The permit does not authorize access to any property. Landowner permission is still required. Feral swine trapping on game lands is allowed only with permission of the Commission. Call 919-707-0150 to inquire about trapping feral swine on game lands.